Posted May 8, 2018 & filed under Book News, For Teachers & Parents, Great Books, Interviews & Guest Posts. As a newbie writer, I had the great good fortune to move to the same Texas town where Kathi Appelt lives. When we met I was instantly struck by her generosity, not to mention her talent. She became my true mentor, encouraging me in all things including attending Vermont College of Fine Arts. It was there that I first heard her read some of the early pages of THE UNDERNEATH. I was instantly mesmerized – as have been so many readers now, adults and children alike. It’s no wonder the novel is a Newbery honoree. It’s no wonder that ten years after publication we can celebrate this gorgeous piece of literature and introduce it to a whole new cadre of readers. For teachers especially, Kathi has created an activity page which you can find here. And she’s also sponsoring a fabulous giveaway of 15 copies of THE UNDERNEATH, in addition to a classroom set of books and a Skype visit! Just click the link to submit your entry to the giveaway. 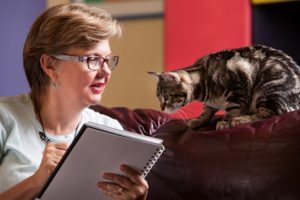 Kathi has generously come to the blog today with a guest post on fear and bravery, and on the necessary marriage of those two opposites that leads to what saves the day: love. I’m honored to host her. I confess that I’m not a brave person. Rather than walk up and step on cockroaches, I tend to throw shoes at them and duck for cover. I don’t watch scary movies. No Texas Chainsaw Murders for this girl. I refuse to swim in bodies of water in which I cannot see my feet. There are crabs, don’t you know. You will never find me at the top of the Empire State Building, or any other tall building for that matter. I will never grace the gondola of a hot air balloon—you can go to the bank on that one. I also don’t eat very hot and spicy peppers, nor do I drink anything stronger than a nice Chardonnay. You could say that I’m pretty much just a big old scaredy cat. So this begs the question of why I tend to write books that put my heroes in positions that could clearly be considered “life or death.” On the surface, the answer seems to suggest that I’m somehow living vicariously through my characters, putting myself in impossible situations and then bravely winning the day. And I think there may be a modicum of truth to that. Don’t we all wish that we could be as resourceful as Kirby Larsen’s Hattie, in Hattie Big Sky, or as wise as Jacqueline Woodson’s Lonnie in Hush, or as funny and witty as Alan Cumyn’s Owen, in The Secret Life of Owen Skye? The thing is, I know that Kirby, Jacqueline and Alan are all of those things that their characters are: resourceful, wise, witty. And more. So much more. But where does brave come in? 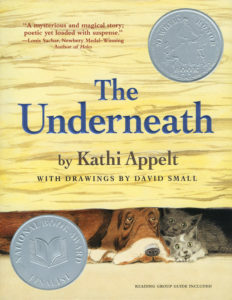 In the ten years since The Underneath was published, kids around the world have written to me about this book, and one of the things they almost always talk about it is the bravery that my old hound dog and his two kittens share. And they are brave, aren’t they? They would do anything for each other, including putting their own lives on the line. The hard question that I carried with me while I wrote this story was not for my characters. I knew their answer. Rather, it was for myself. Would I, could I, do the same? Would I risk my own life for someone I loved? I sincerely hope that I would make that choice, but I simply don’t know. I’ve never been confronted with this kind of situation. Every day, there is another story in the news about heroism, about someone who put him or herself in harm’s way. It’s something that doesn’t only show up in fiction or in movies. It can seem random—like recently, when James Shaw, Jr., a young father of a four-year old daughter, threw himself at a shooter at a Waffle House restaurant in Nashville, TN. Something compelled him to act bravely. And thank goodness, right? But in a story, we need more. We need to understand why a character acts and reacts. We need to know what compels him or her to step into those hero shoes (and not throw them at the cockroach). In other words, fiction is not random. For me, it always boils down to fear and love. They’re the opposite sides of a single coin. Ranger loved those kittens, and they loved him. We’re talking Big Love, the kind that rolls over you in waves. But wherever there is Big Love, there is Big Fear. And behind that Big Fear is the very real terror of losing those we love. There’s no bigger nightmare. When I first became a parent, I remember reading an article in Mothering magazine. The writer had just had a baby girl. I had just had my baby boy. In the article, she claimed that becoming a parent was a “terrifying beauty.” I was struck by the truth of that phrase. There is nothing more profoundly wonderful, and at the same time, so wrought with the horrifying prospect of loss. It’s not just with our children that we experience this kind of Big Love/Big Fear. It’s the same with all those we love, it’s the same with our pets, it’s the same with places. I call them “the three p’s.” People, pets, places. They’re where our hearts find meaning and yearning and sustenance. They’re where we are confronted with the depths of our own characters. In writing Ranger and the kittens’ story, it was this Big Love that I was reaching for, but in order to find that, I had to find the Big Fear too. One can’t exist without the other. Writing The Underneath didn’t make me brave. But it definitely gave my heart some room to expand. And I can’t help but think that when we give ourselves a chance to explore the “terrifying beauty” of our own lives, we can confront our fears and make more space for love to save the day. Kathi Appelt is the New York Times best-selling author of more than forty books for children and young adults. Her first novel, The Underneath, was a National Book Award Finalist and a Newbery Honor Book. It also received the PEN USA Award. Her other novels include The True Blue Scouts of Sugar Man Swamp, a National Book Award finalist, and Maybe a Fox, one of the Bank Street Books Best Children’s Books of the Year. In addition to writing, Ms. Appelt is on the faculty in the Masters of Creative Writing for Children and Young Adults at Vermont College of Fine Arts. She lives in College Station, Texas. To learn more, and to find curriculum materials and activity pages, visit her website at kathiappelt.com. Fifteen lucky winners will receive an autographed paperback copy of The Underneath. In addition, one Grand Prize winner will win a classroom set of 20 copies of the book PLUS a 30-40 minute Skype visit for her/his school, classroom, or library with award-winning author Kathi Appelt. Enter here! Janet, thank you so much for hosting me today! Your friendship and support means the world to me. I’ve shared this story with many students, and always find that students are extremely happy when, at the end, Grandma Moccasin chooses love over hate, and then is rewarded with the one thing she wanted most in life. This is a gem of a story, as is The True Blue Scouts of Sugar Man Swamp, Maybe a Fox, Keeper, and all of your wonderful picture books. A student asked me recently who my favorite author was, and I was quick to respond, “Kathi Appelt!” He asked, “What has she written?” and I replied, “Oh, let me show you!” And low and behold, another student was caught in your magical spell. This is so great, Carol! (That Kathi is your favorite author would be my response, too:) ) Thank you!! I had the pleasure of meeting and working with Kathi at the Highlights workshop in Chautauqua years ago. She is an inspiration! She is, Kathleen! I’m so glad you were able to work with her. She’s also a wonderful person.